The solder bridge is present on all of my arduino mega boards, so it should be fine. The heater block and throat is held in place by a setscrew on the larger aluminium block, so you should be able to loosen the setscrew and rotate the smaller block until straight. Building this printer has been one of the most rewarding things that I've done in a long time, enjoy it. I started with both and feel that they an improvement over the experiences I've read others go through with the original FT offerings. So I have been using my F/T 2020 i3 for quite some time now and I don't know why I didn't think of this question before but here it is anyway. Since our height limit is the carriage contacting the motors, which by the way, I have upgraded to the motor extensions, why do we have the hot end mounted so far low below the carriage? If we were to raise it up to just below the carriage, we could gain quite a bit of build height. Edited 1 time(s). Last edit at 12/15/2016 12:13PM by MendingThings. This is my first foray into 3d printing, and have done a small amount of arduino tinkering in the past. 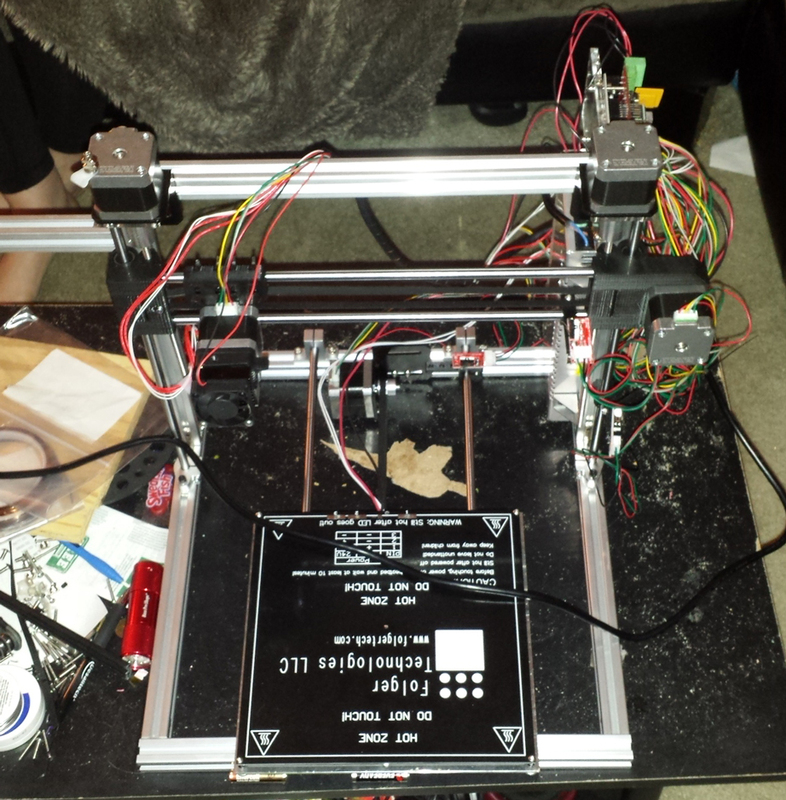 I just bought a Folgertech 2020 Prusa i3 (w/out LCD) and finished putting it together last night. I set all the stepper motor board potentiometers to the corresponding voltage in the build guide (side note, I was within .05 mv on some, and just couldnt adjust it finely enough to get to exactly .350 (X, Z, E) or .550 (Y) - is this OK?) and then uploaded the firmware and started tinkering in Repetier. Here's where my problem occurred, and why I'm writing in to ask for your help. I clicked 'X Home' and the extruder moved left along the x-axis and bumped into the threaded/chromed rod bearing holder and buzzed as if continuing to push, then stopped after a second or two. First, I thought that 0,0 should be at the back right? I figured I had needed to manually start it next to the x end stop at the far right so it would be able to travel the full 200mm to the left. I did this, and clicked 'X Home' again, and it traveled to the left and bumped back into the bearing holder and buzzed again. I looked over my print shape setting in Repetier and I have this (attached). I copied the settings from the build guide, but the "Park" settings dont look right to me - do they conflict with the printer shape settings being 0,0? OK, final thing: after bringing the extruder back to the far right manually a 3rd time, it no longer moves at all, and only a small buzzing noise can be heard when I try to move it with the Repetier manual x movements, although Repetier shows that it's x-coordinate is moving. Is my motor burned out? How can I tell? 2) How come "X Home" on repetier brings the extruder carriage to the left? I thought "Home" was back right? 3) After my x-motor tried to push the carraige too far to the left multiple times, it now only makes a faint buzzing when repetier tries to move it right or left. Is the motor dead? How do I tell? Also, attached is a pic of my complete build, note I don't have glass on it yet, but will be doing this soon. Like I said, I'm a newb, so if I left out info or pics that might help to diagnose this, let me know. Thanks so much in advance - can't wait to get up and running and join this awesome community!! I'm getting a lot oozing prior to a print. This is leading to strings and drags in the first few layers. Others have recommended entering a retraction code at the end of the print. I'm using Repetier-Host and slic3r. After the final G92 E0 line in the G-code? I need to replace the control boards that came with my printer. Looking at your website, I see you are sold out of the 2650's and Ramps packages. Is that because the MKS combo board is replacing them? I have your 2020 i3. Will this board work?? I'd like to get an order going as soon as I can so any guidance would be appreciated!! You will find John Folger there to answer your question although you might be better off emailing them. You can get the Ramps/Arduino combination at a lot of places including EBay. I also have the i3 as well as the FT5. That should work but you would be better served with a pair of tweezers or needle nosed pliers and steady hands to snag the excess just before the print starts. I use a Raspberry Pi and Octopi so I have the same problem unless I want to go down to the basement and catch it before it starts printing. Kind of defeats the purpose of Octopi, doesn't it? You could also search for a 'nozzle wipe' routine. I've seen a few but haven't tried them. Edited 3 time(s). Last edit at 01/04/2017 11:05PM by tjnamtiw. Everyone is over on Facebook now for some stupid reason! It's not really well suited for a forum IMHO. Anyway, are you POSITIVE that you have your X endstop plugged into the X MAX set of pins, right next to the Y plug?? Also, in Repetier you must set under Printer Settings in the upper right corner 'Home X' to MAX. Try that. I assume you haven't been screwing with the Marlin firmware and switched things there. Does the X axis move left when you tell it to with Repetier? In fact, people move the mount up to the upper holes in the plate when they replace the hot end with an E3D version, so go for it. I haven't moved mine since I now have an FT5 for the BIG stuff..
Well that is unfortunate. I hate FB. I have started an email convo but replies seem to take forever. I saw the control boards elsewhere but thought I'd give FT first crack at my business. I like their printer alot!! I appreciate the info though, thanks! Also, I see you'e using the BLTouch. Are you pretty satisfied with its performance? I was looking into bed levelers and I really want to keep my glass bed. This seemed like a great solution! Amazon has plenty of boards available through Prime if you want to go with what came with the printer. Then I took the chrome rods from the Y plus new 400mm lead screw when I did that update. Extended the 2020 on the side and have 198mm build height. Yes, I have BLTOUCH on both my machines and love them. I also use glass. The latest releases of Marlin > 1.1.0 RC8 > even has direct support for BLTOUCH with scripts on the LCD screen to test it and reset it, if it's alarming. Have you purchased boards from Amazon. If so, any vendor recommendations?? Prices are good but some of the reviews are troubling. Heated beds seem to be problematic for the cheap clones. Not sure I want to learn how to change MOSFETs. Edited 1 time(s). Last edit at 01/05/2017 04:49PM by DynamiteHack. Currently with out any issues. Heats up fine prints fine. And with amazon if it is prime and doesn't work easy to return and replace. I have been running my printer now for about a year and half. LOVE THIS THING! But I am gearing up to do some upgrades. 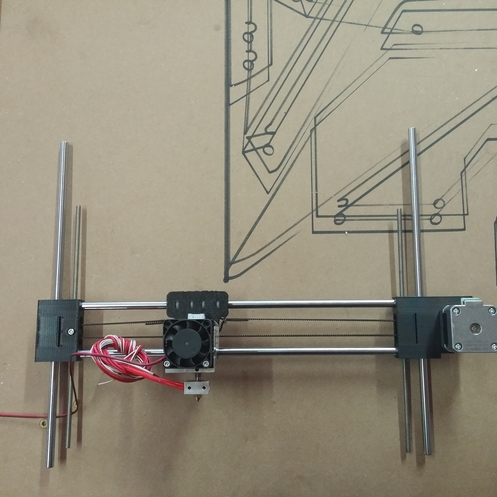 I want to start with auto bed leveling, I have printed a few pieces, servo mount and arm, but I am coming up short on where to go to find the code on how to do this or maybe a how to. Can anyone help me out? Thanks, I have a part printed that I am going to use for the servo bracket and the servo arm. What I don't have is where do I setup the auto leveling software? Is that in the config.h or how do I go about doing that? Hey, has being a while that I don't check the forum... my printer is running like a champ, to the point that I'm thinking to get second one just for the fun!!! I still do the manual bed leveling process after 5 to 10 prints or if I remove the glass to clean it and prepare surface to do some big print... but today I was looking online and i found the BLTouch sensor, did some of you have any experience with the little bugger? Looks really nice and cleaner than the servo arm (I have a small fan installed on my hot end to help moving some air while printing so space it's kind of priority). This is a 3part series. from the switch and ramps config all the way to marlin config. I do believe you need to have the Beta firware from Folgertech for the i3. Which is available on the google drive. What will the beta software do for you that you don't get in the original software? I still do manual leveling and am getting good prints - so what will I gain? If it's running good, don't screw with it!!!! When you decide to put a BLTOUCH on it, Marlin 1.1.0 RC8 works great with no changes. I or any other number of people would be glad to share our config.h file with you. That is why I asked because it is running well. Its like the EverReady bunny - it just keeps going and going and going. I find it easy to level the bed and the only thing I have changed on it is adding a part cooling fan. I have an FT-5 as well and have BLTOUCH, E3D, ... on that one and using RC6, and again unless I am sure that I will gain something I will not change that either.